This surname MACKRELL was a nickname from the Old French “makeral,” a fish known by that name. It was brought into England in the wake of the Norman Invasion  and is now a Yorkshire surname, on whose coast the particular cod of that name was caught. Far from being ashamed, this sounds as if the families may have actually taken pride in the name in those early days. In this article we’ll take a look at the evolution and progression of the name across the British Isles and into America, specifically West Deer Township, Northern Allegheny County, Pennsylvania. We’ll find the landmarks and the gravestones of our earliest namesakes there and see that there are still relatives living in the North Hills of Pittsburgh almost 225 years later. Hugh and Walter Makarel, both of Lincolnshire, were documented during the reign of King Henry III (1216-1272). By 1273, a Makarel may be found at Cambridge University. Richard of the same surname, only spelled Makerall, was recorded in the papers of Edward IV (1461-1483). By 1513, a young person of the same name had registered at Oxford. The grave of one Jone Mackarell has been at St. Dionis Church in London since 1546. The name ‘Fearghal’ or ‘Fear-Ghail’ seems to have assumed the form ‘Cairell’ by the 5th century A.D. History records the son of the first Christian King of Ulster, Muiredach Muinberg, as Cairell Coscrach and his son as Baetan Mac Cairell (or MacCairil). From whichever direction you believe the MacKrells became so widely dispersed throughout the British Isles, France westward or from Ireland eastward, we know that the various Lords McKerrell of Scotland, geographically somewhere in the middle and considered part of the landed gentry, began with John in 1490 and today are seated at Hillhouse, in Dumfries just across the Irish Sea from Ulster. And speaking of St. Columba, be careful not to confuse “MacKrell” or any of its spellings with the Irish word “Kells,” as in the ancient, rare, and famous Book of Kells on display at Trinity College, Dublin. The good saint is given credit for creating this priceless work, an illuminated translation of the Gospels, sometime after he founded the Abbey of Kells, Meath County, just north of Dublin, around 554. A good source of information on the MacKrell name can be found at SurnameDB.com. While my Google search of the name also turned up an abundance of lawyers, I also found Judith MacKrell, the illustrious dance critic for the Guardian periodical, and Gyles MacKrell, remembered as the hero tea planter who organized a rescue of refugees in the Far East during World War II. 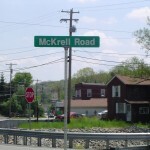 The Pittsburgh, PA, area seems to have been the original American home to many McKrells over the years, if the internet family boards are any indication, and many of those families started in the heavily Scots-Irish West Deer Township. We believe we are related in some way to most of these. Why? Let’s consider their Irish roots. We know that the surname MacKrell, with all of its spellings, can be found throughout Ireland. But recent research has pinpointed our MacKrells in the parish of Maghera, Londonderry County, Northern Ireland. We looked specifically at public records of the late 18th and early 19th centuries. As we said, there are many ways to spell the surname we have known as MacKrell: Mackerell, Mackeral, Mackrill, McKreil, McRill, McCreal, Mckrilles, McCrellias, MacReal, etc. This variety is not unusual because what we call “literacy,” i.e. reading and writing, among the lower and middle classes is something relatively new and somewhat unique to America. Certainly at the time of our families’ emigration, as few as ten percent of the European population could have been considered “literate,” and those were usually the “clerks,” or ordained “clerics.” In other words, information, including names, was passed along orally, and when it was recorded, say at the immigration office, it was written down as it sounded. We are fairly certain that the Mary MacKrell who was baptised in 1788 in Ballinahone, Church of Ireland Parish, daughter of Henry and Mary, was the individual who became the wife of Robert Norris, Jr. (1785-1867). She had a sister Hannah who was christened three years later and a number of cousins baptised in the same church. As other articles have claimed (“Old Norris Families Residing in Maghera Parish” and “Introduction: Norris”), Robert sailed from the Port of Londonderry in December 1810 on the ship Mary Wallington and arrived in Philadelphia in June 1811. He would have been about 25 years old. It is unclear whether he and Mary were a couple at the time or why the entire trip took six months. We know the Norrises spent some time then in the East, probably New Jersey, although they may have had family just across the Delaware River in Norristown. By 1820, Federal census records show the couple’s ages between 26-45, having five children, and living in Western Pennsylvania. Several other questions remain unanswered: When did Mary die, and when and whom did Robert then marry? Robert’s second wife, believed to have been a Catherine, is often confused with his father’s (Robert, Sr.) wife, who is believed to have been Catherine Dowling, the given name of Robert, Jr.’s and Mary’s son, my great-great grandfather Dowling (b.1823). Unfortunately, none of these questions is addressed John Graff’s terrific book published for the 150th anniversary of West Deer Township and the chapter entitled “The McKrell Family.” Neither are they addressed in an interesting genealogy written in 1914 by Rev. Joseph McKrell. The old Bull Creek Presbyterian Cemetery does list many of whom we assume are cousins in our MacKrell family, but we can’t be certain. What we do know is that the 1876 Beers School Atlas shows the “relative” proximity of farms in West Deer Township owned by family namesakes: Gray, Norris, and of course, MacKrell. 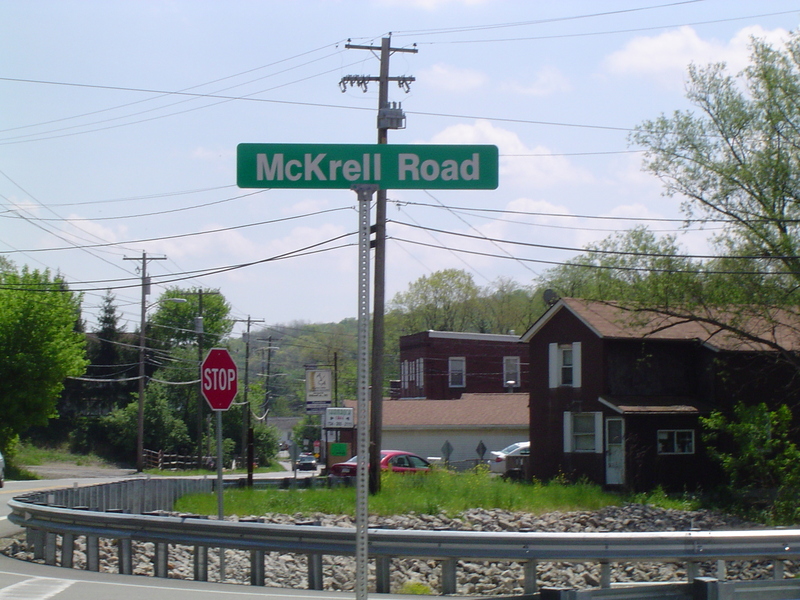 Today, McKrell Road (notice the change in spelling) runs from Russellton, formerly Gray’s Mill, northwest. The McKrell farm, for whom the road is named, was owned by James Boyd McKrell, Sr. (b.1891), probably one of our Mary’s grand nephews. According to the West Deer Township book, James “Boyd,” Jr. still lives on a portion of the farm, which is now owned by the Dlugopolski family. Incidentally, the Boyd name also goes from West Deer back to Northern Ireland: Rev. Abraham Boyd, first pastor of Bull Creek Church. married many of my ancestors and his family had reportedly accompanied the Gray patriarch James to America. The Boyds lived near the MacKrells in Ulster. What’s in a name? In the case of MacKrell, the long history, wide distribution, and variety of spellings surely represents a richness in our DNA and our “story.” Ironically, the association of with the fish may represent both the hard work in surviving as a family and the odor of so many questions yet to be answered. I can assure you that we are just beginning our research in both the Old and the New Worlds. That too suggests the old paper records and the new digital databases.